Liebherr Group pulled in the biggest revenue in its history last year in spite of a static market in Western Europe, its most important sales region. Provisional figures reveal total sales of €9.2 billion for 2015, an increase of €425m on the previous year, with growth across its construction machinery and mining section as well as its other activities including maritime cranes, aerospace, machine tools, hotels and domestic appliances. 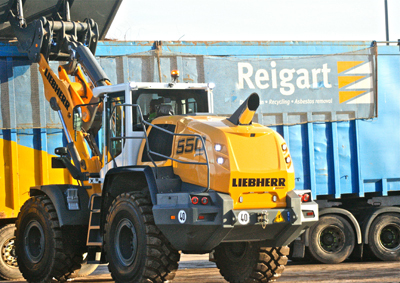 The company chose Scotland for the global launch of its new wheeled loaders in November. Revenue from construction machinery and mining products rose by €337m to €5.6 billion. That section of the business includes the earthmoving, mining, mobile cranes, tower cranes and concrete technology divisions. “Business developed quite differently in the various sales regions,” said the company. Sales declined in Eastern Europe and on the African continent but improved in the Middle East, the Far East and Australia and in America. In Western Europe revenue was largely unchanged from the previous year. Key investment projects during the year included construction of a new logistics centre in Germany for the worldwide supply of spare parts for earthmoving machinery and expansion of the diesel and gas engine production facilities in Switzerland. For the current year, the group expects moderate growth in revenue across most product areas and said it hopes to enjoy “positive impetus” from the Bauma exhibition in Munich in April. Final figures will be announced in June.